The Best White Noise Machines for Offices – Mask Annoying Sounds! If you have any type of job that has you spending long stretches of time in the same office space with a lot of people, chances are you’ve felt irritated by all of the noise. Your coworker in the next cubicle will have their music playing, and someone will be blowing their nose. And, to make things worse, the open-concept office somehow makes every conversation seem louder. And, there always seem to be additional noises you just can’t figure out. What’s that whirring, clanging noise in the distance? You don’t know, and you’ll probably never find out. But, you sure hope it’s not very important. You don’t need to be particularly sensitive to noise to become irritable after some time spent in a loud environment. Unfortunately, the fact that our world seems to be evolving to be even noisier isn’t helping. Whether you work in a noisy manufacturing plant, or in an office space where sound travels, this article should have something to ease your suffering. Back in July, I posted an article about the best ways to soundproof your office. In it, I wrote about how getting a white noise machine for your office space might be beneficial. In this article, I plan to elaborate on that position. If you stick around, I’ll also share some top-rated sound masking machines you could use in your office. So, in the following article, I’ll briefly explain the science behind white noise and why it can help you with noise canceling. Then, I’ll tell you which features to keep an eye out for while shopping for white noise machines. Finally, I’ll review some of the best white noise machines on the market. So, let’s begin. We all know that many people work best when they have some kind of noise in the background. Research has shown how distracting conversation can be when we’re trying to focus. The same goes for music with lyrics. Any unfamiliar noise, as a matter of fact, detracts from the matter at hand. That is why many people can work comfortably around noise that is incredibly familiar – like having an episode of Friends playing while you work, for example. White noise, on the other hand, doesn’t have words or melody our brains need to get used to. We can’t get distracted and sing along to it. In addition, white noise has sound masking properties. Since it’s actually just a mix of all humanly accessible sound frequencies playing at the same time, white noise is effective at covering sudden noises that occur within the same specter of 20-20,000 Hz. By having all of these sounds in your ear at the same time, white noise allows you to focus exclusively on a single task. It drowns out outside noise and your inner voice, too, until you’re forced to do your work. Also, white noise can let you do your job, while not bothering people in the surrounding cubicles. So, there are good reasons to have your own white noise machine at the office. Most people won’t even notice it, but it’ll improve your productivity. Or, if you’re a business owner looking into creating a good work environment – it will improve your employees’ productivity. Here’s an article that explains the pros and cons of using white noise in the workplace. Now, let’s see why you might want your office sound masking machine to have certain features. So, allow me to explain why you should care about each of these. Obviously, you’ll be bringing in another source of sound to your office, so you should be careful. You’ll definitely want to avoid any machine that can conceivably produce an annoying sound. There are probably many other colleagues in your office space who are as irritated as you are with the noise levels, and you should take care not to add to that. If you want to have the best sound quality possible, keep an eye out for acoustic sound machines, or sound conditioners, as opposed to electric white noise machines. Also, you might want to go for machines who have non-looping claims. You might even consider those that offer various other sounds, aside from white noise. Of course, if you stick to white noise only, looping shouldn’t be an issue. So, with the white noise setting, you can be pretty sure that the machine will do a good job at noise canceling. However, to avoid agitating your coworkers, you should also make sure that the machine has at least a few volume settings. The appearance of a white noise machine might be important to some, while others will care more about its functionality. Besides personal taste, make sure you pay attention to your work environment. Ask yourself if your boss would mind having a flashy or weird-looking machine in the office. Most white noise machines on the market are of the ordinary variety, anyway. So, if your boss needs you to maintain a professional environment, you’ll be covered by any of the machines in my reviews. If you’re going to be using the same machine at work and at home, you might want to consider having a smaller model that can easily fit in your bag. If you’re a business owner looking to improve your employees’ productivity, you may want to buy something bulkier and of higher quality, though. In that case, the machine will probably stay in the office. Naturally, your budget will be pretty important when shopping for a white noise machine. You wouldn’t want to buy a gadget for your work and have it cost you a serious percentage of your paycheck. Luckily, most of the noise canceling machines I’ll be reviewing will be in the $50 range. That’s not really high or low end. I’ll also throw in a few $30 options, just so you’ll be aware of the features each price tier offers. And, for those who like to splurge, I’ll also review a $100 white noise machine. Finally, we managed to get to the good part! Allow me to present some of the best white noise machines for office spaces. The sound masking machines on this list are great for making your cubicle quiet enough to get some work done. These white machines are presented in a roughly ascending price order. Now, that doesn’t mean the lower-end machines aren’t good, but this way we’ll be able to work our way up to the $100 machine. I’m just as curious to see what makes it so expensive as you are! So, without further ado, here are my reviews of the best noise canceling machines on the market. The first two white noise machines on this list are suspiciously similar despite being made by different manufacturers. So, I’ve decided to present these products in a bundle. The main visible difference between the two is that BESTHING’s sound machine is black while Aurola’s is white. Although Aurola’s device is a few dollars more expensive, both are in the same $30 range. Both machines are 5-inch squares. The speakers take up the entire front of the devices, with the exception of the lower third part, where control buttons are located. In the upper row, you can set the timer to have the sound gently fade out after 30, 60, or 90 minutes. There’s also a power button and a volume dial. On the second row, both machines have 7 buttons, allowing you to choose between 7 sounds. Besides the white noise, they include wind, thunderstorm, ocean and rainforest sounds, and a summer night setting. Or, if you plan on using the machine at home as well as the office, you can even use it to put your child to sleep with the lullaby setting. These options would be great for unwinding. However, I’d recommend sticking to the white noise around the office, to avoid seeming unprofessional. Both devices also promise non-looping sounds, which is important when you are using the other settings. And, if you’re concerned with disrupting people in the surrounding cubicles, you could also plug in your headphones in the back of the devices. You’ll also find a USB port and a DC charge port in the back. The whole thing is barely more than an inch wide, so it should comfortably fit in your bag. The X-Sense white noise machine is 3.54 inches tall and wide, and 2.65 inches deep. Like the previous devices, its speaker takes up the whole front of the machine, though its controls are on top of the device. It comes in matte black and white, and it’s very small and unobtrusive, which makes it ideal for office use. And, the X-sense device is just over $30. There are six buttons in total on this device. There’s a power button to the left and a timer to the right. You could use the timer to have your machine turn off after 1, 2, or 4 hours. The volume control has 30 levels, which is excellent if you don’t want to bother people around the office. The remaining two buttons allow you to switch between the 30 sounds that are available until you’ve found the one you like best. 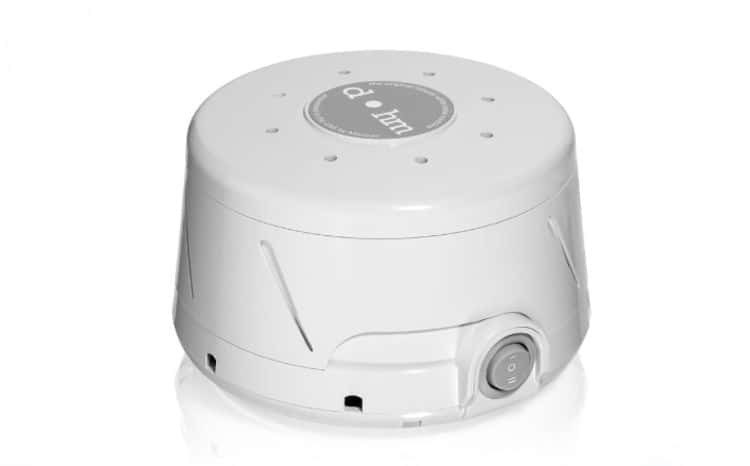 This white noise machine offers 18 nature and ambient sounds, as well as 12 total fan and white noises. That is an excellent selection, especially if you’re one of the people who gets annoyed listening to a certain blend of frequencies – this way, you can switch it up! And, the noises are non-looping. This X-Sense device has a 2500mAh rechargeable battery. That means you’ll be able to use it for 10 continuous hours. Also, like the BESTHING’s and Aurola’s devices, this machine has a headphone jack and Micro USB port. And, it even comes with a matching cable and an adapter. The Marpac Dohm white noise machine is different from the ones mentioned above, and it’s a bit higher in price since it costs about $50. It’s only 3.3 inches tall, so it’s still small enough to fit in a bag, but it has an almost 6-inch wide circular base. This device also produces Marpac’s signature “Dohm” noise by having asymmetrical fans rotating at two possible speeds within an acoustic casing. Since it’s this kind of an acoustic machine, it only has a single switch you can flip upwards or downwards, high or low. Remember, acoustic machines make their own sounds, as opposed to digital ones that simply play white noise through speakers. Once this acoustic machine is up and running, you can rotate the upper casing to adjust the tone. Before you decide to purchase Marpac’s sound machine, you might want to see if you even like their signature white noise enough to want to listen to it while you work. Its simplicity extends to its power source, as it can only run on AC. Either way, this white noise machine comes highly recommended. However, I predict that the moving mechanical parts can be more easily damaged than the parts of a digital machine. Marpac’s white noise machine comes in white, black, gray, or tan. So, pick out the one that best matches your office space, and adjust the settings however you like them. When you adjust the sound to where you like it, the setting won’t change since it’s a mechanical machine. The sound quality will remain consistent for the same reason. LectroFan’s white noise machine is another wildly popular product for offices. This device is only 2.25 inches tall with a 4-inch heptagonal base. It also goes for around $50 at online retailers. The speaker is on top, and the control buttons are on the sides. This white noise machine has 10 fan sounds and 10 other sounds, including white, pink and brown noise. Pink and brown noises, since I didn’t explain them earlier, have the same frequencies as white noises. The difference is that pink and brown noises have more balance between the volumes of the sounds in low and high ends of the spectrum. So, the high-frequency tones aren’t as loud as they can be in white noise. Just like the other white noise machines, LectroFan also has volume and timer settings. However, you can only set the timer for 60 minutes, which isn’t the longest period, as you’ve seen. However, if you intend to use it at work, I don’t think you’ll have use for the timer setting, anyway. The device is powered by AC or USB cable, which means that you can plug it into your work computer and keep it on your desk. Since it’s completely digital, it should use up less energy than it takes to get mechanical fans moving. HoMedics Deep Sleep II is a bit larger than the previous machines I mentioned. Still, you could take it to work, or even leave it in your cubicle. It’s 8 inches tall and 4 inches wide, but the speaker takes up only about two-thirds of the height. The large speaker grill actually has two speakers under it, which allow you to adjust bass and treble. Even though this machine was manufactured to help people sleep, it can easily help you focus at work. It certainly doesn’t look unfit for a professional environment. Beneath the speaker grill is a small digital screen that displays the sound being played, the time that’s left on the timer, as well as the volume and screen brightness. Control buttons are located under that screen. The power button is in the middle, with the timer and brightness on each side of it. You could set the timer to 30, 60, and 90 minutes. You can choose between 4 white noise tracks and 8 nature and ambient sounds. This device even comes with a remote control, which could be really helpful in an office. And, you could even place it in the middle of the room, between cubicles. There, everyone could adjust it manually, while one person hangs on to the remote. Like other mid-range devices mentioned above, the HoMedics Deep Sleep machine costs around $50. The Sound Oasis S-550-05 is a device with a 6-inch square front. The machine has 6 buttons at the bottom which allow you to choose from 6 sounds. You can choose between hearing oceans, streams, rain, white noise, summer night, and wind sounds. All of these features come at the typical mid-range price point of $50. If this selection doesn’t agree with you or your coworkers, you can also switch out the sound card, and slide a new one in at the top. The sounds this machine plays are recordings, although the loops are almost imperceptible. However, the loop could become noticeable after a while. Still, this card system basically allows you to have as many sounds as you want, or rather as many as the manufacturer makes. The machine has two wheels on the right-hand side in the back. One is the timer setting, which has 4 positions, including continuous play, and gradual fade after 30, 60, or 90 minutes. The other is volume, which you can set to be as loud as you want it to be. This Sound Oasis device is powered by 4 AA batteries or AC. It can also be hung on a wall, which could be a great feature for your white noise machine to have. Or, if you don’t want to share, or otherwise disturb your coworkers, you could also plug your headphones into it. The BTS-100 is another Sound Oasis product that uses a preloaded memory card to store 10 sounds. However, this device is not only a white noise machine but also a Bluetooth speaker – and I’m all for dual-purpose gadgets. The product itself is almost 3 inches tall, and it has a 2.5-inch wide circular base, and it’s also very lightweight. Even though the BTS-100 is fairly unremarkable as a white noise machine, the fact that it’s a dual-purpose gadget bumps up its price to around $60. The controls, along with the power button and volume control, are all positioned around the bottom of the device. You can hit play or pause the track when you use the device as a Bluetooth speaker. Speaking of which, you can turn on the Bluetooth mode by holding the power button for 3 seconds. That will make the white noise machine visible to your other Bluetooth devices, so you will be able to pair them. This Sound Oasis device is powered by internal rechargeable batteries and comes with a USB cord. Its small size makes it a great fit for an office space. Also, you’d be able to liven up your coworkers by switching to music during your break. The Sound + Sleep white noise machine is almost 5 inches tall with a tear-shaped base. It’s surely one of the most interesting-looking devices on this list, while still looking professional, and it goes for upwards of $70. The whole top side of the device is covered by a speaker which plays High Fidelity non-looping sounds. This machine will need to be plugged into an outlet, so no batteries or USB cables. All of the controls are centered in one area on the side. These controls include a big track dial, as well as power, timer, and volume buttons. Additionally, there’s also a display button that dims the light indicator. There are about 5 nature sounds and 4 ambient sounds, as well as the standard white noise setting. The timer allows for the device to shut down in 30, 60, 90, and even 120 minutes. This Adaptive device offers two more very interesting settings – “adaptive” and “richness”. By using the machine with the adaptive feature on, the device will automatically adjust the volume of the sound to drown out anything that’s happening in your surroundings. So, if someone in your office space started to laugh loudly, this device should compensate in volume. This setting is a staple of Adaptive Sound Technology devices. The richness feature, on the other side, allows you to adjust the content in each track. There are two levels, so if you press it once, your ocean will also have seagulls. And, if you press once more, more ambient noise will be added. The only downside of this white noise machine might be its size, as it might be too bulky for some bags. Finally, let’s see what kind of features you can get with a $100 white noise machine. The SNOOZ white noise machine is 3.5 inches tall and 5 inches wide, having an almost ball-like shape, but with a flattened bottom and top. The device has three control buttons on top of the machine, the power button, and two volume controls. The circular grate that surrounds the sides of the device is available in black or gray. This machine produces white noise by having a spinning fan inside of the acoustic casing. In spite of the arguably old-fashioned mechanical mechanism, this device has the tech features to justify its price. The manufacturer has an iOS and Android app that goes along with SNOOZ. The app can turn the auto scheduler on and off, and it has a special nursery calibration. Aside from that, the app can also control several devices. So, you may use one at work, and another one at home, for example. The SNOOZ white noise sound machine also has 10 volume levels. But after all of this, can we really say that any acoustic white noise machine is worth this kind of money. Even with the app connectivity feature, I’m not sure. If you’re thinking about buying it, that’s a question only you’ll be able to answer. Hopefully, this article has given you some insight into how a white noise machine could help you keep your focus. If you’re tired of having to put up with loud noises and struggling to concentrate, you could try one of the devices I covered in my reviews. Once more, I’d say that you should go for a machine that’s in your price range. That is why I tried to review machines from several price categories. Luckily, if you work in a smaller cubicle, any of these small and cheaper devices should work just fine. However, if I were you, I would try to find one that at least has a USB cable, so you can use it with a power bank. So, whether you’re looking to block out the noise coming through your window, your loud colleagues, or a machine, I’m sure you’ll find a white noise machine that fits all of your needs.